Things Go From Bad To Worse To Ridiculous For Cowboys. We have all found out just how much the Cowboys lost in the overtime period against Arizona. Romo is out for at least 3-4 weeks, McBriar for the season, etc. Now, Roger Goodell and the NFL has suspended CB Adam “Pacman” Jones indefinitely again and at least for 4 games due to the hotel incident last week in Dallas. With Terrence Newman out an additional 3-4 weeks after having sports hernia surgery, Roy Williams still out with a broken arm and Pat Watkins possibly returning this week from a neck injury, the Cowboys secondary went from being touted as one of the best ever to one of the most decimated ever. Most fans are panicking enough from just Romo’s absence, but how this will effect the team is now bordering on the “ludicrous” level. Normally I agree with Goodell’s strict stance on player conduct, but from all reports to date, this Pacman event was really nothing to be so concerned about. There wasn’t an arrest and there were only “allegations” that he might have been drinking. Nevertheless, Goodell imposes a stiff penalty after the Cowboys found no serious breach of their own. At this point, I’d be happy if Dallas were to be 5-4 going into the bye week of Nov. 9th under Brad Johnson, but with the other injuries and suspensions, I’d be very surprised if that were the case. Patrick Crayton and Bradie James can only do so much in their efforts to rally the team, what needs to happen now is some serious coaching and strategy changes. 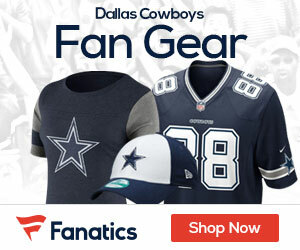 Dallas can find another punter and are now working out two possible prospects, one of which attended training camp for the Cowboys in ’07 and this year with the Broncos, Sam Paulescu. Paulescu also played under special teams coach Bruce Read at Oregon State. The other punter, Ben Graham spent the last four seasons with the Jets and is Australian, just like McBriar. Dallas still has some good talent in the secondary with Mike Jenkins and Orlando Scandrick, but they are only rookies who need some leadership to guide them during games. Defensively and offensively, there are going to have to be some drastic changes. Brad Johnson, although a wily veteran, is 40-years old, virtually immobile and has limited arm strength. The O-line, which hasn’t been providing the greatest of protection of late, will have to play even better than if Romo were in to protect Johnson. This limits any attempts to get deep passes to the wide receivers, so the offense will be limited overall. Add in the possible loss of LT Flozell Adams, and the prospects of Johnson being well-protected get even if-ier. 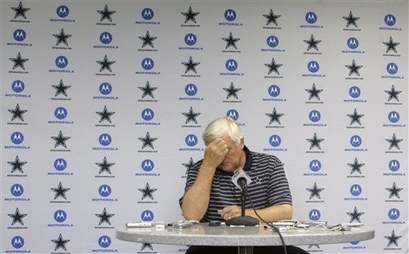 I think Wade Phillips’ expression in yesterday’s press conference says it all about the status of our team right now. But none of this is expressly impossible to overcome, plenty of teams are faced with injury problems to their starting QB. What remains to be seen is whether Dallas can perform as a team to make the best of the situation, keep themselves in playoff contention, and hit their peak in December for a change. bodyguard) might look like. Think bodyguard. Pretty funny video. Check it out.